The stand mixer was otherwise occupied, so I kneaded this one in the food processor. Put everything except the water into the food processor and let it spin. Pour the water in through the feed tube as fast as the dough can take it in, and continue processing until it forms a ball. Check the dough for consistency. Depending on the type of instant mashed potatoes used, the dough could feel gritty. When I buy them, I look for a brand with the fewest additives, and I found one that's basically just cooked, dried potatoes with no extra stuff. Which is great. The downside is that the pieces are like nuggets, so it takes a while for them to hydrate in the dough. If you're using flakes, they'll hydrate faster and you won't have that intial grittiness. The finished dough should be smooth and elastic. If it's not elastic, continue processing for about 30 seconds at a time, checking it each time, and letting it rest in between, so it doesn't get overheated. When the dough is done, take it out of the processor and put it into a bowl, drizzle with oil, cover the bowl with plastic, and set it aside to rise until it's doubled in size. My dough was rather warm, so it rose really quickly. After 20 minutes, I punched it down and let it rise a second time. Then, I sprinkled cornmeal on the bottom of a loaf pan, formed the dough into a log, and put it in the pan to rise. When it reached the top of the pan, I slashed the top and popped it into the oven where it baked for about 40 minutes. I miscalculated the speed of the rise a bit, and got the bread into the oven a little quicker than I should have. I didn't get as much oven spring as I expected, so the bread was a little denser than I wanted, but it's still a nice, flavorful loaf. If I was going to change something, I think I'd pop it into the fridge after taking it out of the food processor to take the chill off for a longer, slower rise. This is amazing! I've baked bread before, but it never turned out well. :( WHy do you need bread flour? You don't absolutely need bread flour, but it makes it easier to get an elastic dough, which is what you need for a good structure to hold the air bubbles and get a good rise. Bread flour has a higher protein level than all-purpose flour, and that protein is in the form of gluten, which is the stretchy stuff. 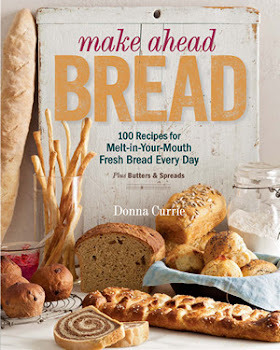 If you don't use bread flour, you can add gluten to the mix to get the same result, or you can use all-purpose flour and do a lot more kneading and/or refrigerate the dough overnight to allow the gluten to develop during the rest. If you want to use all whole wheat flour, you can do that too, but it tends to be a much denser loaf and it's a little more complicated. There's a really good recipe for a whole wheat loaf in Peter Reinhart's Whole Grain Breads, but it's fairly complicated. You make two different mixtures the night before and combine them the day that you bake. It's one of the best all-whole-wheat breads I've ever made.